Offer valid in select countries. For countries not shown, go to international orders. All orders come with a free tote for the gift giver. Your tote will be shipped after payment is processed. Yes, I would like to give one year of Vanity Fair for just $10. Includes Print + Digital Access. You may cancel at anytime. Customer Service can be reached at vanityfair.com/customerservice, 1-800-365-0635, or by email. This introductory offer is only available to customers who have not been subscribed to Vanity Fair within the last 180 days. Vanity Fair publishes monthly, except combined issues that count as two, as indicated on the issue's cover. First issue mails within 6 weeks. Subscribers: If the Post Office alerts us that your magazine is undeliverable, we have no further obligation unless we receive a corrected address within one year. You may cancel at any time during your subscription and receive a full refund for unmailed issues. All orders are subject to approval. By ordering, you agree not to resell any subscriptions purchased from this site. 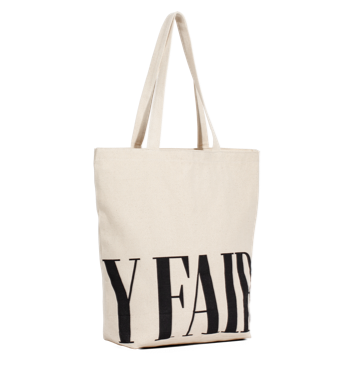 All offers include our exclusive Vanity Fair tote, free. Subscribe today. Subscribe today and get a free, wraparound Vanity Fair logo tote. Stay in the know with Vanity Fair - the cultural conversation starter. Get both print & digital access for just $5 today. Plus, you'll receive a free tote.